Your "Marketing Plan" starts with your 'Keyword Research' also known as 'Keyword Marketing'. You need to first identify your target market for your product/service that you wish to sell, and then assess the demand and competition for your product. Why? This way you will feel the pulse of your market, analyze the competition and prepare your 'Marketing Plan'. How you will do this? Obviously through an effective 'Keyword Research'. When I started off online, I did not have this knowledge and the proven keyword research methodology that I will discuss on this page. I was all the time chasing wrong and un-targeted traffic. As a result I only lost money and did not realize my goal, to "Make Money From Home" with "MLM". But I braved all the odds, studied and persevered to succeed. My hard work and perseverance paid off big time. I learned quite a lot in the process. Keyword research is one area where I am proud to say I have almost mastered the art. OK, enough of my bragging. All I am saying is that, I have been there and done that. I know the process works. Why Market Research is Darn Important? How to Research and Evaluate Your Niche Market? How to Uncover the Hidden Keyword Nuggets? How to Read Your Visitor and Purpose of the Visit? Seriously, What is the Purpose of Market research? Therefore you should pay close attention to what I am saying, read every word to the end of this page, if you want to learn this essential skill, needed to succeed in 'Online Marketing'. That's a good question. And the answer to that is also simple. You see, keywords have become extremely critical to achieve good "Search Engine Positioning" and profitable "PPC Marketing". Search engines are consistently improving their search algorithms in favor of relevant keyword-focused content pages. The engines read text and not graphics, and has become sophisticated with complex algorithms, to read and index the 'keywords' on your page. And keyword research is the only way to bring up the most relevant and profitable keywords related to your topic and write keyword-focused content pages. Engines can tell a lot about the content of your web page. You write 'Web content' that pleases the engines and your visitor, you have a success formula right there. You see your rankings improve dramatically, generating a torrent of targeted traffic. According to me, this will only continue, as, it’s the only way, engines can be sure that their results are relevant to a search query. And a thorough keyword research is the starting point to ensure relevancy, that will help the engines and please human visitors. Not only that, If you use "Google AdWords", Yahoo Search Marketing or any other Pay Per Click services, your campaign lives or dies on your ability to write good ad copy based on your 'Keyword Research'. Having said that, you will need a good 'Keyword Research Tool' capable of discovering not just any keywords, but, the high demand low supply keywords that are easy to win and also has a good buyer intention. You might wonder, "From where am I going to find such a tool?" Relax. I have already made that job easy for you. Have a look at this tool, that will take your keyword marketing beyond the conventional research, and will split wide open your niche market, to expose the hidden keywords to go after. Experiment with their 'FREE' trial offer and scale it up as needed. You need to identify your 'Niche Market' for your product/service. 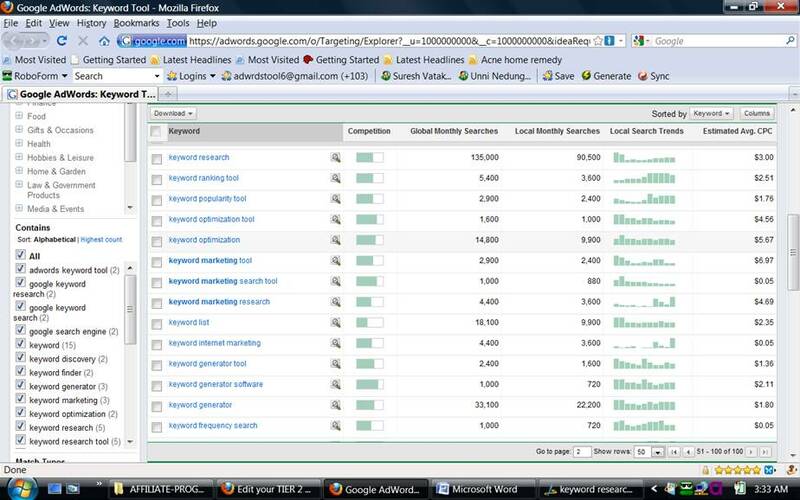 ---> Do a quick research using 'Google Adwords Keyword Tool', for the keyword related to your product/service. Because it's free and also the results include "PPC" information that comes directly from Google’s own real-time databases. PPC is an indication of the competition for a specific keyword. If you are planning to use "Google Adwords" and "PPC Marketing" to drive traffic to your website, then, this information will be extremely useful. This first hand information that comes out of this exercise, gives you an overall view of your niche market and the competition. Note the advertiser competition bar. This indicates the number of adwords advertisers fighting it out for this keyword. Now, if you find tough competition, then that means, this keyword is popular among the surfers and that it will be difficult to rank for , any time soon. This will also mean that you will have to pay a good price, Cost Per Click (CPC), if you are using "Google Adwords". But, you are certain of one thing. This niche is in demand and there are good number of searches, as indicated above. Should you target this keyword? Well, that really depends on your 'Marketing Plan'. If you are after the free search engine traffic, then, you will need to really spend a good amount of time to rank for this keyword. know where you stand and what should be your next step. That's the beauty of 'Keyword Marketing'. If on the other hand, you want to speed up the process and drive traffic to your website almost instantly, then, you need to consider "PPC Marketing". The quintessential techniques are discussed on the "Adwords Tips" page, if you are going to use "Google Adwords". Either ways, you will need to target your niche keyword, most economically and effectively, to generate a good amount of visitors to your website. For this to happen, you will have to go after related keywords, that have a reasonably good search volume with lower competition or supply. That takes us to the next step in the process. The keyword tool provided above will do the job for you very well. ---> The keyword has no money in it. (No body is competing for this keyword!)?? Therefore, just because a keyword is high on demand and low on competition, it doesn't mean this will be a profitable keyword. You must further analyze the keyword to determine the 'commercial intention' of the searcher behind that keyword. Your 'Keyword Research' should include this crucial analysis in order for you to be 100% sure of a keyword's worth. This leads us to the last step in your keyword research process. But, before we jump into that, you need to take a look at this keyword tool that is very reasonable yet very powerful, in that, this tool essentially covers the last step in our keyword discovery, and brings to you the most profitable keywords to target, in a silver platter, so to say. We come to the final step in your 'Keyword research' process. Determine the commercial intent behind the keywords. "What the heck is commercial intent?" Well, it's basically the 'Search Psyche', meaning, the actual intention of the searcher behind the search term. In other words, these are the 'buying keywords' that is normally typed in by a surfer at the end of the buying cycle, where, a decision is made to buy the product/service. For example, if You are looking to buy ‘Keyword Research Tools’, then, you will be searching on, ‘Keyword elite’, ‘IMeye’ etc. You will not be searching on a broad keyword like, ‘keyword research’ or ‘keyword tool’ etc. The intention of the searcher behind the keyword term will be evident, if you closely notice. Otherwise known as ‘Buyer Keywords’. These keywords are more focused, narrow and extremely targeted. The next thing is the sale...$$$$ Ka-Ching!! A vast majority of people miss this 'Key' point in their 'Keyword Research'. They are also leaving 'easy' money on the table. I learned this after a long time. Now, how to determine the commercial intent for all the keywords, especially, if you have a long list? It's a daunting task to do manually. The easiest way to do this analysis, is by getting the tool provided on the link above. You can get 'Micro Niche Finder' here. The reason why you may want to use various keyword research tools, is because, each tool has a specific functionality and will be specialized in one area. tools, in my honest opinion…. -> Keyword Spy: Spies on your competition as the name suggests. A very remarkable tool to judge the ad competition and estimate on the CPC costs. A top of the class keyword tool. Definitely recommended. -> IMEYE: An all-in-one weapon for extremely effective keyword research. Highly recommended. -> Keyword elite 2.0: This tool is especially recommended to pull in a huge list of keywords. Besides, it also researches the competition for a given niche/keyword. An excellent tool to perform multiple functions. -> Micro Niche Finder: An extremely good tool at a reasonable price that delivers 'Online Commercial Intent' for each keyword. You will accomplish your keyword research in 3 steps, with the help of the tools listed above. There is no way that you can hope to succeed without proper keyword research. And this is why the vast majority of websites have no traffic. There is no mystery to Market research and analysis, no matter what some people would have you believe. I will provide with more strategies and techniques for an effective 'Keyword Marketing' in my future updates. So keep coming back to this page more often. Also ensure that you click on the links below to read on the various "Internet Marketing Strategies" where keyword research is widely used.